Pete Talbott is a California native and harried Boston computer wonk still grieving over the death of his wife Terri, when he found himself at the wrong end of Gino Parini’s .45 reading his own obituary torn from that morning’s newspaper. Talbott figured it was all a big mistake until Parini showed him his wife’s obituary too, and this was a mystery Talbott couldn’t leave alone. 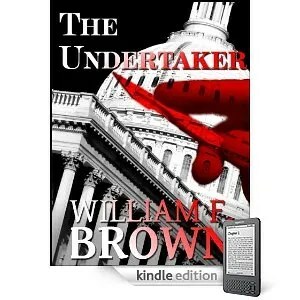 From a funeral home in Indiana, to car chases on the Dan Ryan, a bloody Back Bay townhouse, snipers in New York City’s Washington Square, sleazy lawyers, corrupt County sheriffs, mafia hit men, the FBI, an army of Chicago cops, and that unforgettable scene in the upper berth of an Amtrak Train, “The Undertaker” is a thrill ride with a touch of humor and romance. Someone with a penchant for sharp scalpels and embalming tables is planting bodies under other people’s names; and if Talbott doesn’t stop them, he and his quirky new girlfriend, Sandy Kasmarek, will be next on the Undertaker’s list.